Now that my boys are finishing up the 3rd and 5th grade, we have had more opportunity to use the Dictionary than ever before. When we'd go to look up a word, IT WASN'T ALWAYS THERE. While many words are there along with great example sentences and definitions, new vocabulary just isn't included. It's not Noah's Webster's fault that they didn't have modems or morse code back in the day. This led me to buy the Merriam-Webster's Collegiate Dictionary the other day. But for kid-friendliness and usefulness in home studies, I would recommend Merriam-Webster's Collegiate Dictionary. If you can afford and have shelf space for both, the 1828 would be valuable from a historical aspect and for its incorporation of the Bible in its definitions. With its example sentences, it would be excellent for use in Bible or character studies. The MW Collegiate does not give any example sentences with its definitions, which can be a positive or a negative depending on how you look at it. But its straightforwardness and scope lends itself for use in a homeschool (or any) setting. Anyhow, that's my 2 cents on Dictionaries. Do you have either of these dictionaries? Do you just use Dictionary.com? What are your thoughts? We actually use Webster's New Explorer Large Print Dictionary. I think that the large print makes it very kid friendly. It does have a pronunciation guide, but does not have sample sentences. I like it a lot, but I would prefer to get the collegiate one someday. This is a help to me, as I was looking for a dictionary for my kids. We just have a Christian dictionary, and most of what we look up is not in there. And I didn't know there was such a thing as Dictionary.com! Thanks for a helpful post Marsha! I'll probably be buying the Collegiate dictionary as well. 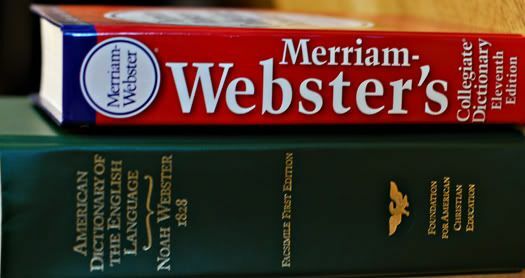 I have been wondering about the Noah Webster, I read a lot about it around the web...we have a small one from Wally World from back to school blitz....really need another. Right now we mostly use dictionary.com. Real dictionary in the works for upcoming year. Thanks for your thoughts! :) We use two or three different dictionaries all the time. We love to use Noah Websters "Big Mean Green" (my girls name for the big book) for Bible vocabulary. It's great to see how word meanings have changed, and how that effects our interpatations of Scripture. It's funny that you should mention it, because I personally just used the 1828 version today for a post I'm working on. But for school purposes, we often use the modern version for the reasons you listed. I do tend to get the 1828 out more for my older son (10) as his assignments get more in-depth, but I'm not sure that it's as necessary as some would have you believe. Just a great addition! However, most of the time, I use dictionary.com, just because it's easier. And because I am almost always on the computer when I happen to need the word anyways. Even more than dictionaries though, I love, love, love a good thesaurus - my high school English teacher got me started on always having one handy and I still flip through mine occasionally just reading various entries. Does that make me a nerd or what?! I was doing some "Spring Cleaning" today and in my closet I found 2 old dictionaries that belonged to my Grandpa. One is dated 1937 and the other 1953. A lot of the "new words" were related to World War II. I had the 1828 dictionary on CD-ROM. I need to find it and see if it's too old to work on a newer computer! 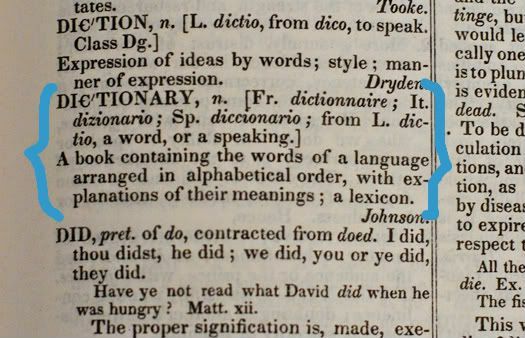 Our most in-demand dictionary is the DK Oxford Illustrated Dictionary. Someone has always made off with it and I have trouble finding it. That's so funny! I have a REALLY old dictionary from when my mom was a little girl - I love it, but Matt had a collegiate one that he said was a "real" dictionary. Now? Dictionary.com is my best friend, I can hardly type a facebook status without using it! After the Bible, a dictionary is the next best book. There is so much knowledge that can be obtained from just opening the cover. Right now, my 2nd grader is the only one who is using a dictionary. He started last year and we're using a children's dictionary, but will be getting a more complete one sometime this summer. I would absolutely love to have a copy of Noah's Webster's dictionary. Thank goodness someone had a sense to make some standards w/our language. Can you imagine how confused all of us would be? I actually use the online Merriam-Webster dictionary, but prefer a physical book and also want my kids to learn how to use one. I have an old Websters New World that I got at a thrift store. I think that a print dictionary is a necessity in any home library. We use it A LOT! I had the same experience with the 1828. It has been an excellent resource for Bible study, but it was frustrating to the kids when they couldn't find a word for their other subjects. So now I let them use The American Heritage Dictionary my husband had in college or the smaller sized Webster's New World Dictionary.